UC Santa Barbara professor John Bower's nonprofit organization, Unite to Light, works with philanthropic groups like Rotary, which distributes Luke Lights to students in Ghana and other parts of the world. 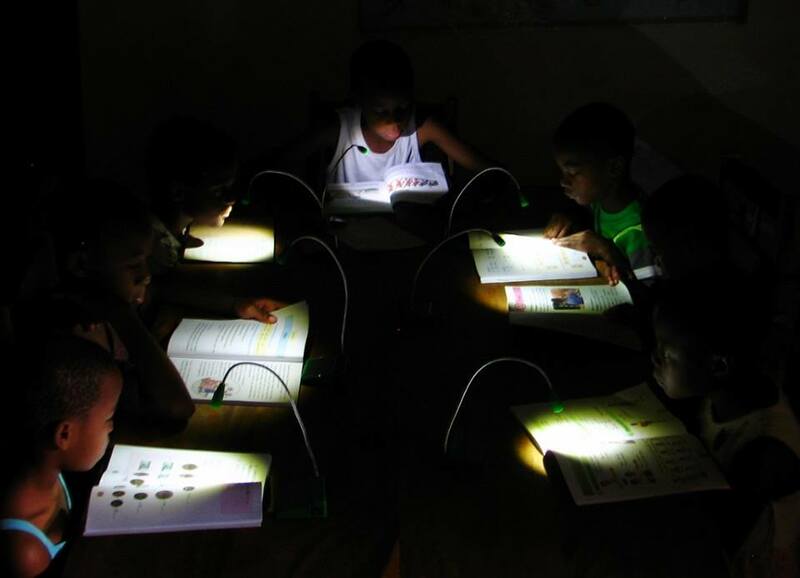 UC Santa Barbara professor John Bower's nonprofit organization, Unite to Light, works with philanthropic groups, which distributes Luke Lights to students in Haiti, seen here studying, and other parts of the world. UC Santa Barbara professor John Bower's nonprofit organization, Unite to Light, works with philanthropic groups like Rotary, which distributes Luke Lights to families in Guatemala, as well as other parts of the world. With the spirit of entrepreneurs and the heart of philanthropists, many professors in UC Santa Barbara College of Engineering dream big — pursuing ambitious projects to aid people around the world. Four who have devoted enormous time, research and resources are professors John Bowers, Chandra Krintz, Rich Wolski and Elizabeth Belding. They have worked at odd hours and in diverse locations — African villages, California farms and Native American reservations — to bring modern technology to those who otherwise might not reap its benefits. With assistance from UCSB students — graduate and undergraduate — and working with research partners and nonprofit organizations, these engineers practice altruism in ways that have produced affordable lights, sustainable farming tools and broader Wi-Fi access in remote rural areas. For 15 minutes every night, a crude kerosene lamp provides dim light for a young girl trying to complete her homework at a rickety table in a tin shack in an African slum. The fumes are noxious and the smoke scratches her eyes. If knocked over, the lamp likely would burst into a ball of fire, burn down the hut and perhaps injure — or even kill — those inside. While inconceivable to most of us, Ghanaian scholar Osei Darkwa once described this true account of daily life in regions of Ghana — where there is no electricity — to electrical and computer engineering professor John Bowers during a meeting at UCSB. Caught off guard, Bowers, who holds the Fred Kavli Chair in Nanotechnology at UCSB and serves as director of the campus’ Institute for Energy Efficiency, recalled how he began listing the college’s renowned accomplishments with energy efficiency, LED lights and solar cells. “I’m feeling pretty good, you know,” Bowers said, laughing. “We’re changing the world, right?” Not so much, according to Darkwa. No one in his country can afford flashlights, let alone high-tech gadgets. After that discussion, Bowers, with the Institute for Energy Efficiency and the organization Engineers Without Borders, created the Luke Light, a simple solar-powered LED device. A second-generation model developed later has a USB connection for recharging electronic gadgets like mobile phones. Teaming with Santa Barbara attorney Claude Dorais, Bowers then co-founded the nonprofit organization Unite to Light. Over the eight years since his first meeting with Darkwa, approximately 75,000 lamps have been distributed — to school children and to midwifes, who use them to deliver babies — in Ghana, South Africa, Haiti, Peru and elsewhere. Solar power is free, he added. The lamp pays for itself in three months when compared to routinely buying kerosene. And when fully charged, the lamp can provide four or more hours of light. Long term, Bowers would like to see the operation — overseen by Unite to Light — become self-sustaining with better distribution partners. “We need to set up a network in Africa where we are shipping these things by the crate and people are buying them,” he said. Selling for $10 and $20, respectively, the Luke Light and Luke Light with Lumen Charger have a long life expectancy, which is limited by the battery. The rechargeable battery in the Luke Light can be replaced for about $1. Many philanthropic organizations, such as Rotary International and Direct Relief International, buy the lights to distribute where needed. The devices also are sold directly to individuals online at unitetolight.org through a buy one/donate one program. If you’ve ever used Amazon or Netflix, chances are you’ve been served up suggestions by way of a prompt such as “You might also like.” The data-collection giants predict — with great accuracy — additional items a consumer may want by analyzing his or her shopping and viewing habits. With a small team of UCSB students, Krintz and Rich Wolski — also a professor of computer science — co-direct SmartFarm, a research project investigating the development of an open-source, hybrid cloud program for agriculture analytics to enable sustainable farming practices. The goal is to do more with less — produce more food, but use fewer resources and harsh chemicals. About 20 farms are involved in the project, including experimental operations at UCSB Sedgwick Reserve, UC Davis, CSU Fresno and California Polytechnic State University, San Luis Obispo. So how does it work? According to Krintz, “robust sensors” are placed in various locations on a farm and feed information — which could help track weather patterns, reveal soil composition, measure water moisture, project yields and manage pesticide applications — to a nearby central unit, about the size of a TiVo box. After analyzing the data, researchers can recommend what crops might work best for a farmer. Another aspect of the program is to reduce risks in an industry that has always been a dicey venture, largely because of the whims of Mother Nature. Consider, for example, the massive agriculture losses from the recent five-year drought in California. Damage estimates — from dried-out crops to lost jobs — totaled billions of dollars. Using the SmartFarm program, researchers might have predicted the extent of the disaster. While farmers have been open to the program, they remain guarded about privacy. To allay concerns about revealing proprietary practices, Krintz noted that farmers retain control of all the data. “They don’t have to share if they don’t want,” she said. “But they can still benefit from all that great technology.” It’s one of the benefits of SmartFarm, which only focuses on research. On the Viejas Indian Reservation, where only 15 percent of homes are connected to the internet, residents with service — which is spotty at best — battle frustration while trying to look for work, send emails and post photos. Located about 30 miles northeast of San Diego, the reservation is getting broader Wi-Fi access with improved capacity thanks to UCSB computer science professor Elizabeth Belding’s work with Tribal Digital Village (TDV), which provides internet service to a consortium of 19 federally recognized Indian tribes in the Southern California Tribal Chairmen’s Association. Because there’s no existing infrastructure on reservations and no highways to bury fiber optic lines, it’s very expensive to bring connectivity to these areas, Belding said. “It just happens that tribal reservations are in remote, harder-to-reach areas for the most part.” So, she and TDV set up microwave wireless links on big masts — like towers — with directional antennas for point-to-point transmission over long distances. Noting a huge disparity there, Belding said her team has been working with TDV to improve service and understand how Native American communities use the internet. “Knowing the types of content people want will help us create better infrastructures to deliver that content,” she said. It’s not Belding’s first foray into trying to build a wireless network solution. She previously launched a major project in the city of Macha, a southern province of Zambia, Africa. Though the partnership there deteriorated and the work has since been discontinued, important takeaways made the research worthwhile. Belding noted that any remote community is typically structured in similar fashion. “The characteristics of the access in Zambia are not that dissimilar from what we find on Native American reservations,” she said.